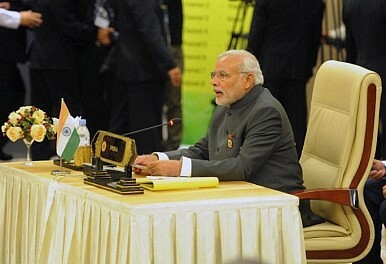 Indian prime minister Narendra Modi speaking at the ASEAN-India Summit. India is looking to boost connectivity and economic integration with Cambodia, Laos, Myanmar and Vietnam, the country’s trade minister said Wednesday. Speaking at the 3rd India-CLMV Business Conclave in Chennai, Commerce and Industry Minister Nirmala Sitharaman said that there was immense potential to boost India’s trade with the so-called CLMV countries (Cambodia, Laos, Myanmar and Vietnam), which had increased from $1.1 billion in 2004 to $11.9 billion in 2014 according to government estimates. She cited a study conducted by the Ministry of External Affairs which suggested that there was a potential of about $100 billion of additional exports to CLMV countries. “The trade links and ties between India and the CLMV countries can be much better and the two governing principles – connectivity and economic integration with regional value chains – are crucial,” she said. In that vein, Sitharaman said that the Indian government was looking to approve a proposal for a project development fund of about $75 million next month to help firms invest in the CLMV countries. The fund – originally announced by Union Finance Minister Arun Jaitley in annual the budget as a way to facilitate integration into regional value chains – can be used for a variety of purposes, including feasibility studies, acquiring land or obtaining clearances for projects, she said. It can also be used to establish special purpose vehicles in the CLMV countries that will allow Indian companies to establish manufacturing plants there. In addition, she said that India was also looking to enhance both rail and port links with CLMV countries. As an example, she said India is in talks with Myanmar to develop connectivity through Chennai port. “We are not just looking at trilateral highways, but understanding how the port connectivity can be improved…We are very keen to open up our ports so that the traditional link between the sea ports can be improved rather than going through a circuited manner,” she added. Ravi Capoor, joint secretary at the Department of Commerce, told Indian media outlets that the country would see more tangible engagement between New Delhi and CLMV countries by the end of 2016, with the physical connectivity measures seeing greater progress.